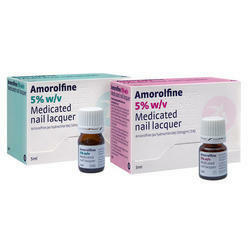 Amorolfine (loceryl) nail lacquer and loceryl cream"
Owing to our years of understanding, we are actively instrumental in presenting top class Loceryl nail Lacquer to our valuable clients. We are supplier of all types of nail paint/ nail polish/ alta/cosmetics colours. We are offering excellent quality Plain Nail Lacquers. Colors always reflect your moods. You can paint your blues away or color me wild ! Color Fever offers an exciting range of 43 shades, ranging from daily and subtle wear to shocking - stunning looks. Add brightness to your beauty with Color Fever's new Neon shades this season. Six beautiful shades compliments yourself and catches your neighbor's eyes ! We offer Nail Polish for our precious customers, which are enormously well-liked for their longer shelf life and purity. We are manufacturers, wholesale suppliers of Nail Lacquer. Nail Lacquer is a raw Material for nail polish. High quality Ready to usew material for nail polish manufacturing.